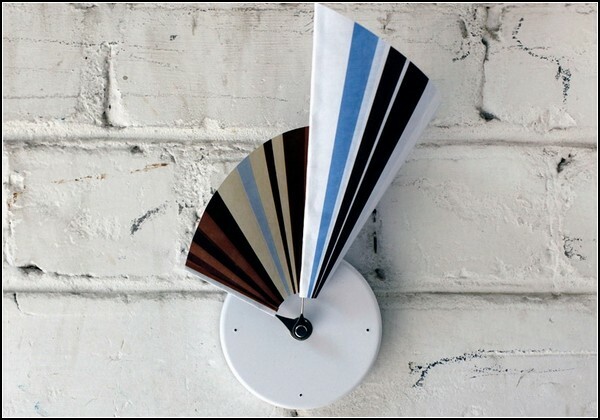 Clock-fan from the company Studio Ve. Original clock, more like a colorful fan of the young beauty, has created an Israeli studio Studio Ve. As any fan, he is able to emerge and spread, simultaneously showing the exact time. The creators called Manifold clock called the "three-dimensional clock. Despite the fact that there is no dial, you can focus on a multi-colored tick marks. Instead of the arrow is used here the edge of the fan. So, watch-fan has artfully bend and shift to "reach out" to the appropriate division. 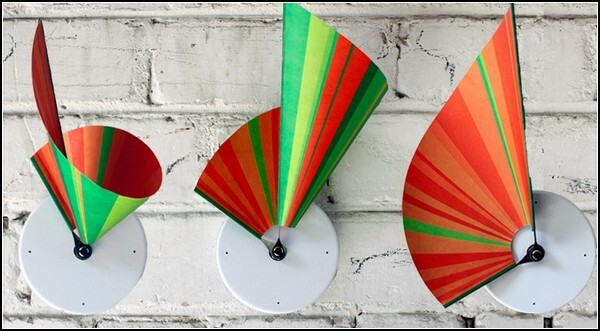 And from time to time "fan" even twisted into a kind of paper bags for seed, ceasing to be "two-dimensional" flat gadget attached to the wall. Apparently, for this Manifold clock and got the title of "three-hours." The secret of his project designers from Studio Ve disclose no hurry.